Unfortunately because of scale, it's a bit hard to tell, but this is really a picture of certain financial doom that is unsustainable, really even in the short-term. As I've written several times before, though everyone in Washington acts as if it can't happen, I am quite a bit less than totally confident that the country can make it to Election Day or January 21, 2013 without hitting the financial wall. Barack Obama, the House, and the Senate were sent to Washington to deal with this. Rather than do so directly, the president and majorities in each legislative chamber punted their responsibilities under the Constitution to a so-called super committee of six Democrats and six Republicans, henceforth referred to as the Super Dupers. The Super Dupers were tasked in November with finding the absurdly small sum of $1.2 trillion in federal budget "savings" over the next nine years (2013-2021). Democrats are said to have wanted $1 trillion in tax increases. Republicans, though willing to increase collections by several hundred billion by lowering rates, phasing out certain deductions, and selling assets, also wanted to see tangible action on spending. The Super Dupers ended up agreeing on absolutely nothing. Because there was no deal, "automatic cuts" spread equally between defense and other spending are supposedly on track to take effect beginning in calendar 2013. President Obama exhibited no leadership during the deliberations (or since then, for that matter), and from all appearances didn't even try to push his party's Dupers into anything resembling an achievable deal. Though disappointing, Obama's virtual apathy is utterly unsurprising. On November 21, as the hopes of any kind of deal were dying, Bill Plante at CBS News, in a rare and stunning display of actual journalism, reported that “the administration couldn't be happier that this is failing.” In their fevered minds, failure gives Obama a club to use on Republicans during next year's presidential campaign. Once again, we have proof that the president and his administration, even as the country approaches a Grecian formula financial abyss, sees his reelection as far more important than America's well-being. None of the alleged "savings" under discussion (really reductions in projected spending increases) would have kicked in until the beginning of the 2013 fiscal year almost ten months from now. According to an Associated Press report, the "automatic" cuts noted earlier (if anyone believes they're really going to happen) won't begin taking effect until January 2013. In other words, contrary to the expectations of most, everyone involved apparently agreed during August's debt-ceiling debacle that fiscal 2012 would be off-limits. Now, apparently, so is the first quarter of fiscal 2013. Even if they had met their definition of super success, the $1.2 trillion involved would have reduced projected 2013-2021 spending of $40 trillion (Page XI at link) by only 3%. Spending for fiscal 2011 was $3.6 trillion. According to the CBO, if spending runs on autopilot for the next ten years -- who's to say it won't, given that the government has already gone without a budget since April 27, 2009? 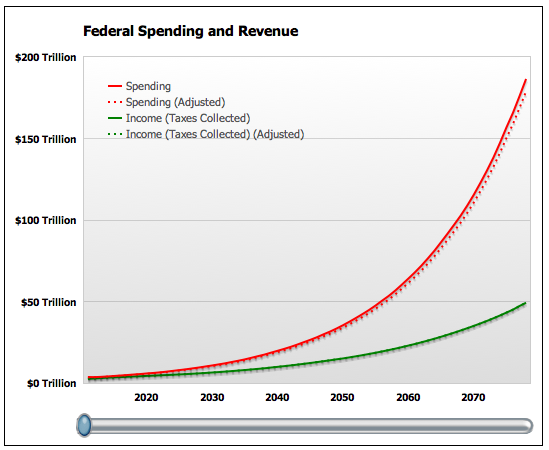 -- fiscal 2021 spending will be $5.4 trillion. Given the tendency to push most savings to further-off years, a "successful" Duper deal might have trimmed that to $5.2 trillion. Big duping deal. If the Super Dupers had "succeeded," the graph seen at the beginning of this column would have budged almost imperceptibly, as seen here. 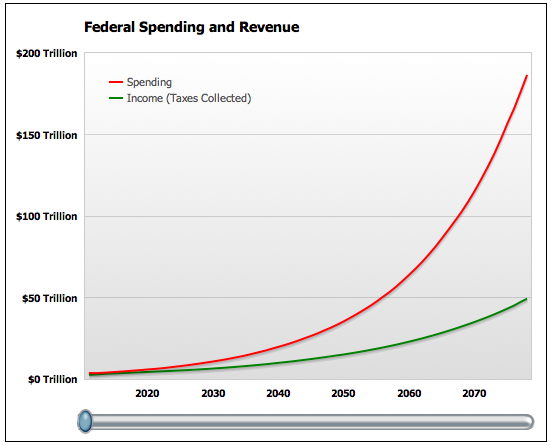 Even that graphic is overly generous, as I had to assume that savings would begin in 2012. In a recent column, Mark Steyn described this as the fiscal equivalent of "Bailing Out The Titanic With A Thimble."